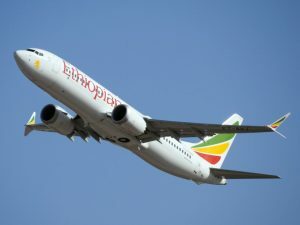 Some random thoughts on the Boeing 737 Max program after the crashes of Lion Air and Ethiopian Airlines. Perhaps the most obvious comment is that Boeing is simply too big to fail. Defence contracts, the 787 and 777X programs, will all continue. The 737 will continue but the Max branding needs a rethink. Airlines will still need their 737 orders of which there are over 5,000. Keeping the Max on the same type certificate as the original 737 seems inappropriate, The FAA was not strong enough. This was basically a new airplane. Was MCAS seems too severe a solution to not a massive problem? “I’m going to stick my neck out today and join some dots that surround the 737-Max MCAS (Manoeuvring Characteristics Augmentation System) chaos. My conclusion is stark, but it is a symptom that needs to be spoken about from an industry insider perspective. So… it appears that MCAS was Boeing’s first foray into an area of design I like to call ‘We can’t trust all the pilots, so let’s make it do THIS’-philosophy. A domain that Airbus embraced and up until the 737 Max, Boeing chose not to. This thread sets out to explain the intentions were good but the application, not so. And what part the senior executives of the Aviation industry played. Let me begin by explaining what pilots train to do. There are two distinct areas of training. One is called Standard Operating Procedures (SOP). This is for the normal days. At 6am, you fly from A to B. B to A. A to C and home to A in time for the evening news. SOP focuses on every pilot doing things the same. So you can fly with a complete stranger one day to the next. That type of training, when all systems are functioning, is the easier part of the job. It is routine. It is to an extent, predictable. The second area of training is the Non-Normal training. A quaint little title given to what really should be called ‘Emergency’ training. This focuses primarily on when Aircraft systems fail. What happened when the data being sensed by this ‘incompetence limiter’ was corrupted? Probably the best example was AF442. At the time, Boeing engineers probably felt vindicated that their design philosophy was superior to Airbus. Instead they relied on quality training focussed on understanding the limitations of the pilot role. But their more unforgivable choice: It made the override procedure a delivery option like they were heated seats or a parking sensor on a new car! And what do modern airlines choose to do in this cost conscious era? To digress for one moment. Here’s an opinion I hear often from non-pilots in casual conversations about my role. Some of you believe the automation in modern aircraft to be ‘sentient’. Far from it. It will always need human input. CEO’s making noises about reduced pilot complements and remote pilot systems. And I haven’t even mentioned the little known epidemic of pilot fatigue. Flying remains remarkably safe; but a shortage of pilots and continued cost-cutting across the industry mean that risks are being taken and the costs of doing so will rove significant….as Boeing is discovering.